While the updated Optec® 5500 is easier to use than ever before, it retains the trusted accuracy it is known for. The Optec® 5500 P model adds the ability to perform peripheral visual screening (a test featuring flashing lights on a horizontal plane with stimuli at 85, 70, and 55 inches temporally, and 45 inches nasally) and sets the industry standard for vision testing devices. Among the features that make the Optec® 5500 so user-friendly are a remote control and use of color-corrected light. This model weighs less than 15 pounds, is portable, and requires a mere two square feet of space. The package includes 12 test slides and a choice of the standard vision testing slide packages, as well as the option to create a vision testing slides library of more than 150 test slides. Contrast sensitivity slide packages are also available for purchase upon request. 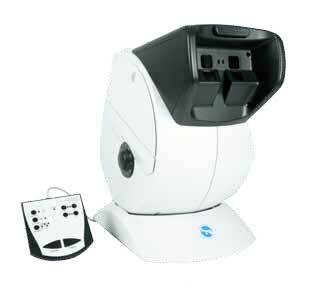 Two independent viewing ports for precise distance and near visual screening. The distance lens system tests at 20 feet and the near lens system tests at 18 inches. Testing between near and distance is also available from 20 inches to 40 inches. Standard slide packages include: Ophthalmic Prescreening, Driver Rehabilitation, Medical with H.O.T.V., Medical with Michigan Preschool, Industrial with Purdue Job Standards Book, and the International with Job Standards Book. The Optec® 5500 P includes a remote control, accessory kit, one standard slide package, and peripheral test. With Remote Control and Accessory Kit. With Remote Control, Peripheral Test and Accessory Kit.